Although the blossoms won't last much longer, the Cherry Blossom Festival runs through April 27, with hundreds of events, performances, exhibitions and tours. A new free app for iPhone and Android will let you browse through all of them by date or category. 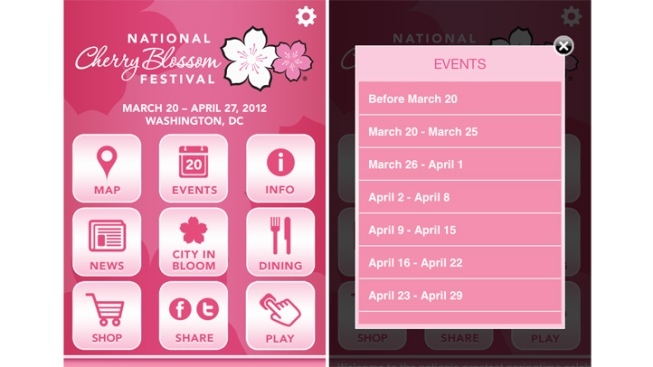 The app also includes facts about the history of the festival, as well as information on fest HW, navigating through D.C., restaurants with Cherry Blossom-inspired dishes, cocktails and more. Purchase Cherry Blossom swag with a tap of your finger, update Facebook and Twitter, and enjoy a collection of Cherry blossom photos. You can even make a personal schedule of your favorite places and events in order to be one step ahead of the crowd. The application is available for download via Google and iTunes.